I want to highlight an article that I recently wrote that was published in FierceMobileIT today called, "Crowd Sourcing to Become More Relevant in Enterprise Mobility." I am intrigued by the idea of connecting geographically disperse minds together to help accomplish the greater good. Mobile technologies and crowd sourcing concepts can help in all kinds of interesting ways. In this article I write about SAP's Streamwork, Salesforce.com's Chatter, online forums and using tweets to understand traffic conditions. I read an article by Todd Morrison, News and Features Editor at SearchSAP this morning on mobile device management and specifically Sybase's Afaria. I knew it was coming as he had interviewed me for it. In this article I share my perspective on Afaria and the MDM market. In summary, MDM (mobile device management) was a nice to have in the past, but is now required by large enterprises. Read the complete article here to find out why. I have the unique opportunity of joining Andrew Borg, Senior Research Analyst, Wireless and Mobility with the Aberdeen Group to present a webinar next week. I invite you all to attend as Andrew will be giving a full report on the current state of enterprise mobility. The competitive pressures of the increasingly global market reward the Real-Time Enterprise (RTE), defined as the organization focused on market and customer responsiveness, swift and agile decision-making, and transparency and immediacy of information shared among internal groups. Enterprise mobile applications have evolved as an essential enabler of the RTE, delivering business-critical information when and where it’s needed. The basic framework is now in place for a virtual renaissance in enterprise mobile applications. New application development frameworks optimized for enterprise data integration have emerged that offer rapid and cost-effective prototyping, development, and deployment of custom or purpose-built mobile applications. This is Part 2 of my podcast interview with Webalo's Founder/CEO Peter Price. We talk about the different mobility models and architectures for implementing enterprise mobility solutions. Part 1 is here. If you have an interesting mobile implementation story, mobile solution or would simply like to contact me to discuss your mobility project please email me here. The Mobile Money News Weekly is an online newsletter made up of the most interesting news, articles and links related to mobile payments, mobile money, e-wallets, mobile banking and mobile security that I run across each week. I am specifically targeting market size and market trend information. Google Inc. is teaming up with MasterCard Inc. and Citigroup Inc. to embed technology in Android mobile devices that would allow consumers to make purchases by waving their smartphones in front of a small reader at the checkout counter. Mobile commerce, in all its forms, is growing exponentially. U.S. consumers of all ages are using their mobile devices for shopping on the go, making more frequent mobile payments, and using their mobile devices as a connector of other sales channels. The New York Times has confirmed that Apple has indeed been working on including Near Field Communication on future iPhones, though how soon it may debut is still up for speculation. Google is working with MasterCard and Citigroup to add Near Field Communication to Android. Google reportedly wants NFC to boost advertising on Android devices and may even give away NFC readers from VeriFone Systems. I read some interesting news today that Smartsoft Mobile has released a mobile application on the Windows Phone operating system that provides access to real-time Inventory Inquiry and Purchase Order Approvals in both Oracle and SAP. In addition, the user receives alerts about pending Purchase Orders to be approved. The mobile application is now available for download on the Microsoft Marketplace. Not many enterprise mobility vendors have released mobile solutions for the Windows Phone operating system to date, but I know from past interviews with Ed Krufka at Smartsoft Mobile that he is a fan of the Windows Phone operating system. You can read more about this application on the Smartsoft Mobile blog. ClickSoftware, the developer of the SAP Workforce Scheduling and Optimization solution, announced today that they have closed one of their largest contracts ever. It is with DIRECTV, the world's most popular video service. DIRECTV selected ClickSoftware's workforce management and optimization solutions to help it improve the management and efficiency of its field service technicians and customer service. Here is a quote from DIRECTV's senior vice president, IT Strategy and Innovation, "We are trying to match the business value proposition of providing exceptional service to our customers for installation and service calls with a technology solution. We feel ClickSoftware is the technology choice to deliver this value to our customers." ClickSoftware has nearly 25 years of experience developing sophisticated workforce scheduling solutions that were first deployed in the military. Today all of these solutions are supported by ClickSoftware's ClickMobile solution for enterprise mobility. In Part 1 of this audio podcast I interview Webalo's Founder and CEO Peter Price about different business models for delivering enterprise mobility solutions and the pros and cons of each. Webalo has a unique, cloud based approach to enterprise mobility that you may find interesting. You can listen to Part 2 here. The Mobile Retailing News Weekly is an online newsletter that is made up of the most interesting news, articles and links related to mobile retailing applications and mobile marketing applications that I run across each week. I am specifically targeting market size and market trend information. While Apple's iPhone has traditionally been the target for brands running mobile marketing campaigns, more and more research is suggesting that Android's share of the market is set to increase substantially. Professional sporting events and concert promoters are pushing mobile marketing to new levels with iVisionMobile.com’s real time text to screen at live events. Sports teams are now embracing mobile advertising when reaching out to fans through this new technology. Research shows 2010 was a year of phenomenal growth for mobile advertising with the U.K. market growing 116 percent to £83 million in 2010. The U.S. and India-based Vdopia Inc, which runs online and mobile video advertising network iVdopia, claims to be delivering $500,000 in profits every quarter. The Asian mobile video advertising market is expected to reach $1.5 billion this year compared to $1.2 billion in the U.S. and $200 million in Europe. As companies continue to make businesses more fuel-efficient, European and North American markets for fleet telematics could jump to $700 million in 2015 from $80 million in 2008. A Norwegian organization that manages nationwide pallet leasing for retailers and manufacturers, is trying out RFID technology in a pilot project to see how effective the tags are for tracking plastic pallets. Stockholm is becoming an m-health hotspot as smartphones and mobile applications are poised to play a greater role in healthcare as doctors and patients embrace the mobile Internet to treat chronic illnesses and improve quality of life. The RFID market is expected to grow around 17 percent during 2011-2013. The reason for this phenomenal growth is that various applications across different verticals have emerged around this technology. One of my criticisms of Sybase in the past was that they gave customers too many options for designing, developing and deploying enterprise mobility solutions. What is wrong with a plethora of options? It can lead to indecision and paralysis. That does not benefit Sybase or the customer. In my opinion, much of Apple's success can be attributed to their lack of options. They tell developers how they should develop mobile applications, what devices they can use, they then review them for compliance to their standards, and tell them how they can be uploaded and sold on the one Apple App Store. Limiting options may frustrate some, but it provides a very well defined path for their customers and development partners. Over the past 9 years I have spoken often to Sybase and iAnywhere staff about mobile development projects, and nearly always left these conversations with more questions than answers. That was rarely useful. I think that the faster customers and development partners can be directed to the appropriate path and have their options reduced, the better. 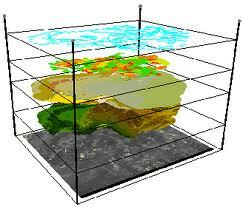 This reduction in options will enable decisions to be made and actions to occur. Since there are literally thousands of different ways mobile solutions can be designed, developed and deployed, the best thing we can do is to learn from mobile experts who have tried many different models and methodologies and can help direct us down the right path or paths. What do you think? Is it better to be provided with a limited number of options based upon a quick decision tree, or to provide you with an unlimited number of options? I would love to read your comments! In an upcoming webinar on April 7th at 12:00 PM EDST, myself, mobile solutions guru Steffen Schwark and Sybase mobility consultant Sam Lakkundi will be sharing our experiences and advice to help you reduce your options :-). The panel will explore current trends in enterprise mobility through analysis of the business processes and strategies used by successful companies to mobilize their workforce, with an emphasis on SAP environments and ecosystem. Kevin and Steffen will share their research on the future of enterprise mobility and outline customer best practices; Sam will elaborate on the specific role that SAP/Sybase plays in supporting mobility for the enterprise. The presentation will be followed by a real-time Q & A session. The mobile retail market will exceed $12 billion by 2014 due to one-to-one marketing and smartphone adoption, Juniper Research reports. Brands significantly increased their UK mobile marketing spend last year, as part of their efforts to capitalize on the growth of smartphone use. Mobile penetration in the Czech Republic is among the highest in Central European nations and is high even by western European levels. Advances in smart phone technology and accelerating consumer adoption of tablets and other mobile devices have spurred an opportunity for marketers looking to make good on the long sought promise of mobile marketing. pay a variety of bills online. I spoke to one of the mobility guys at SAP recently, and he shared that there are potentially thousands of valuable mobile applications that can and should be integrated with SAP systems. I believe there are many uses for mobile applications, but I may want to argue about whether they all deserve stand alone mobile applications. It seems to me that many of these mobile "apps" could really be one application with capabilities to support many business processes from the same mobile application or client. Here is my interview with John that I recorded in Sydney, Australia at the Mastering SAP Technologies conference. I want to thank John for sharing both in person and on his tweets. You can follow his tweets on Twitter @jhmoy. 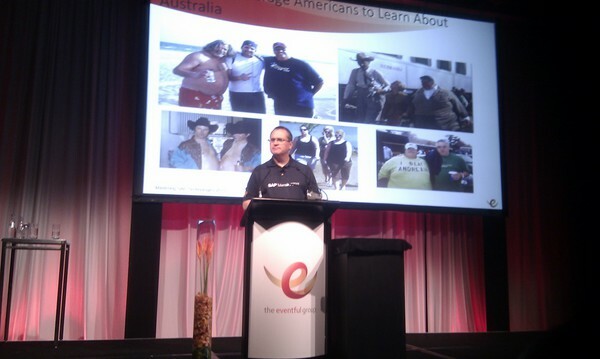 This week in Sydney, Australia I taught a class on Network Centric Operations. I covered the convergence of enterprise mobility, GIS (global information systems), business intelligence and M2M (machine to machine) technologies in ways that helps field service managers have real-time visibility into their field service operations. This convergence requires news ways of thinking, managing, process re-engineering and news ways of integrating these solutions into a unified view. The recent announcement by Syclo about their integration and partnership with GIS software ESRI fits right into vision. Tellabs CIO thinks soon all apps will first be developed mobile, and then a subset converted to desktop. Tellabs says mobile apps will have a short lifecycle. Don't plan for longterm mobile apps, they change too fast. Tellabs has an ethics policy that mobile app users sign before they use personal devices for work. Tellabs says the IT department was the biggest obstacle. They didn't want to give up command and control and give mobile access early on. Tellabs promotes bring your own mobile device to work. Security is installed, a contract signed - personal devices are used. How best-in-class companies deal with the challenges of enterprise mobility management, including the tablet invasion, employee-liable devices, multiple platforms, and security and compliance issues. How SAP’s offerings can help you "unwire your enterprise" and accelerate your business. How Tellabs, an SAP customer, is using the Sybase Unwired Platform and SAP Mobile Workflow to deploy innovative enterprise applications on mobile devices, such as the iPad, to improve the productivity of its employees. Join us for the first one-hour interactive webcast in the series on Tuesday, March 29, 2011 at 12:00 p.m. EDT/6:00 p.m. CET. Register Here! Screens 4-inches and larger sell better that those 3.5-inches and smaller, according to research firm NPD Group, as consumers seek a richer media experience from their smartphones. Amazon.com has opened its Amazon Appstore for Android, offering free and paid applications based on the open-source operating system, albeit with some features that differentiate it from Google's competing Android Market. Nokia, whose presence in the U.S. smartphone market is already small, has announced it plans to move away from its Symbian operating system in favor of Microsoft’s Windows Phone 7. The company has high hopes of boosting its presence in the U.S., but its first Windows Phone devices won’t be ready until late this year, at the earliest. A research report entitled, The Mobile Handset and Smartphone Market in India conducted by Frost and Sullivan puts forth that the mobile handset market's revenues is likely to soar from INR 255.91 billion in 2010 to INR 350.05 billion in 2016. The global value of mobile payments reached an estimated $170 billion last year and could grow to $630 billion by 2014 as new phones are designed to bypass the Internet to directly charge or debit an account. Consumers are quickly turning to their mobile devices to comparison shop, seek product ratings, and search for coupons. Forty-eight percent of consumers use their mobile devices to research or browse products and services. Analysts estimate that as many as 70 million phones sold this year will have NFC capabilities baked into the hardware and software. Mobile contactless payments, in which you pay by holding your phone near the payment reader at the register, are expected to increase by 1,077 percent by 2015. Jason Lante is a hands on IT guy that has a great deal of experiences rolling out successful enterprise mobility projects that included implementing software from SAP mobility partner, ClickSoftware and integrating it with SAP in the outback of Australia. This is a video interview that I recorded at the Mastering SAP Technologies conference with Jason. Welcome to the first edition of the Mobile NFC News Weekly. In our daily research on the mobility market, we are finding more and more information on the subject of mobile NFC (near field communications). Why is NFC interesting? It is one of the key components of mobile money, which has the possibility of changing the way banking, business and consumer transactions are made globally. In an example of the battles erupting as smartphones evolve into electronic wallets, Research In Motion Ltd. is locking horns with wireless carriers over control of mobile payment data. Google is reportedly testing a mobile payment trial at stores in New York and San Francisco. MasterCard claims mobile touch and go payments through microSD cards are the future of mobile phones in Australia. The company made the call following Visa's announcement earlier this week of a 50 employee trial with ANZ of iPhone cases embedded with NFC chips to test contactless payments like in PayPass and PayWave cards. Research in Motion’s, managing director, Steven Bates, says that his company will make a push to integrate NFC into its smartphones and tablets. How Many Mobility Platforms are Enough? 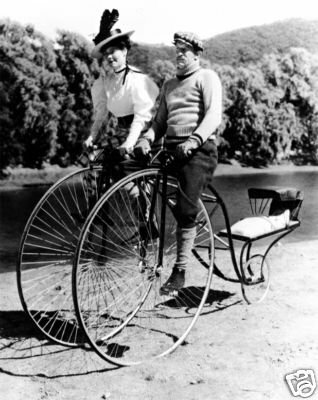 John Moy (on the right). During our discussions John asked a very good question. He asked, "Does SAP/Sybase have a mobility platform for customer facing applications?" I thought about this and said, "Good question!" There are certainly ways to connect customer facing mobile applications with SAP data and processes, but is there a true platform for customer facing applications? How would you have answered that question? I would tell you if I knew. Customer facing mobile applications need to be compelling in order to compete, and for customers to be motivated to use them. They need to have incredible UIs (user interfaces) and great value. John and I would have asked this question of the Sybase folks had they attended, but instead we were left to form our own conclusions. That is a risky venture. Another good question John asked was, "Will one mobile platform be able to support all of our needs?" I believe large enterprises may need more than one. Especially if they have mobile consumer apps. In the retail and CPG space, there are marketing campaigns, loyalty programs, mobile money, coupons, rebates, specials, catalogs, location based services and social networking components to all of the above. I have not seen anything in this area from SAP or Sybase yet. This may be an area where companies may need to work with a specialty mobile platform. 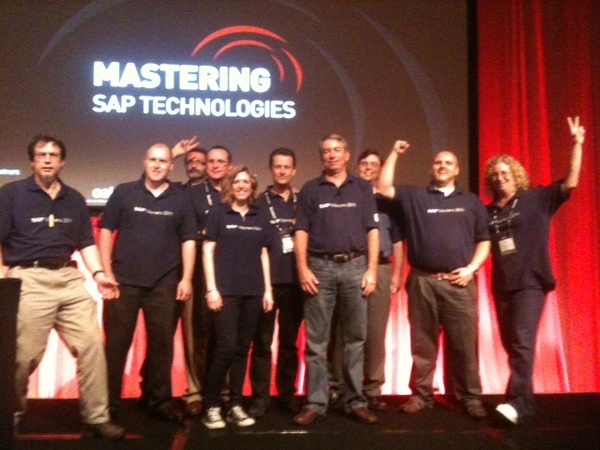 About ten SAP Mentors spoke at this year's Mastering SAP Technologies event in Sydney. I presented one of the opening keynote presentations on Monday, and lead a session called Network Centric Operations in the SAP Environment this afternoon. It was a packed house, but there was a noted absence of any Sybase folks. I met several companies currently interested in purchasing mobile solutions. The strange thing is that Sybase has a sales office in Sydney, but still did not attend. It seems there are still some coordination issues to work out. The barcode was capture and wirelessly integrated with SAP's SCM (supply chain management) system. I attended a session today by Jason Lante from ETSA Utilities on mobile timesheets. He shared how ETSA Utilities is successfully using ClickSoftware's ClickMobile and ClickSchedule integrated with SAP for about 75% of their employees that work in the field. They have achieved their mobility and ROI goals and are looking to expand. I had a gathering of utility, post and CPG company representatives around me following both presentations that I gave. 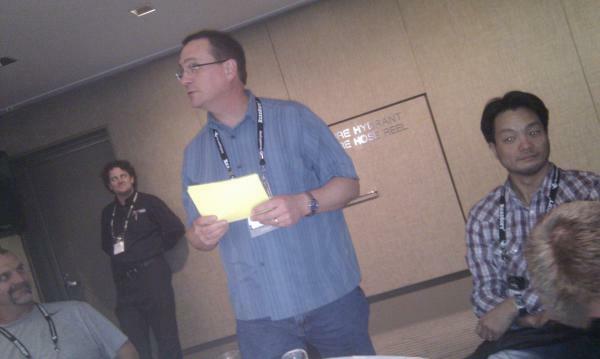 I kept looking around for some SAP utilities or Sybase folks to bring into these conversations, but none were present. I don't think the SAP field sales team quite knows how important mobility is becoming to their customers. 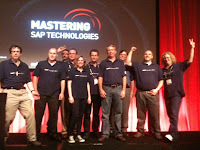 I am speaking this week at the Mastering SAP Technologies conference in Sydney, Australia. Following my presentation this morning on enterprise mobility, I spoke with attendees from MIT's Lincoln Labs and Boeing. Both of these individuals shared that their companies had many requests for enterprise mobility solutions, but security concerns have prevented any from being deployed. This sounds like a real problem! A 2011 study by Kelton Research found that security fears had caused 75 percent of enterprises to delay rolling out mobile apps at one time or another. Yikes! This is not good for business if you are an enterprise mobility vendor. This subject deserves more discussion, but I am working in an outdoor cafe and a tropical storm is about to open up on me and my laptop, so we will pick up this discussion again in the future. Kevin’s Field Mobility News Weekly is an online newsletter made up of the most interesting news and articles related to field mobility that I run across each week. 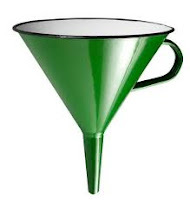 I am specifically targeting information that reflects market data and trends. The U.S. Army will soon evaluate prototypes of wearable mobile handheld computers running battle command capability. New applications will provide dismounted soldiers with network connectivity, command, control and situational awareness. The medical device industry is worth $400 billion in annual sales. Vante, a medical equipment company is restructuring itself to enter the emerging market. The company, formerly known as SEBRA, is retooling itself as a market leader in supplying machines to make medical catheters and seal sterile tubing. Pentagon contractors are developing applications for Apple’s IPad and other tablets in order to command and control unmanned aerial vehicles. IDC has launched the ZB111 wireless-based barcode scanner, to provide low cost inventory management systems in healthcare facilities such as hospitals, clinics and surgeries. I came across this mobility webinar announcement and wanted to share it with you. Nothing beats learning directly from the end user. First Solar has just implemented an enterprise mobility solution and Jay White, Mobility Architect (cool title!) from First Solar will share his experiences. Hear first-hand about First Solar’s road to mobility, the critical decisions they faced and the benefits they’re reaping as a result of successfully implementing an enterprise-grade mobility strategy that is able to scale with their needs. In this informative webinar, Jay White, Mobility Architect at First Solar, will share his insights into enterprise architecture, system integration, and multi-device support and the crucial role they play in successfully and cost-effectively developing enterprise-grade mobile applications. This is Part 2 (see Part 1) of an indepth interview that I recorded with mobility expert Neil McHugh. We talk about all kinds of strategies that companies must consider when preparing to implement enterprise mobility. It's almost too cool to believe. Simply wave a piece of American currency in front of your iPhone's camera and LookTel, created by software company Ipplex, will tell you the denomination without even having to access the internet. Apple, Nokia and Research in Motion together have generated 64 percent of the revenue in the popular and ever growing smartphone market. Verizon Wireless is the last operator to launch a phone under the 4G banner. The first smartphone for VZW’s long-term evolution network, the HTC Thunderbolt promises to be the fastest gizmo on the market. Consumerization, cloud computing, tablet computing and mobile collaboration are among the major trends that will drive the market for enterprise mobility solutions over the next year. I was able to track down Neil McHugh, VP of Sales and Business Development with Sky Technologies today and record his thoughts on a variety of subjects related to enterprise mobility and strategy. This is a very interesting discussion. The link below takes you to Part 1 (see Part 2) of the interview on YouTube. Listen to Part 2 of this interview here. Google is trying to beat Apple to the punch when it comes to making Near Field Communication technology popular in the U.S. Google is about to begin testing mobile NFC payments and plans to do so by installing "thousands" of VeriFone NFC readers at merchants in New York and San Francisco. Recent reports have projected mobile payments would grow to a $680 billion market by 2016. Juniper Research has valued the mobile payment market at $170 billion in 2010 and projected it to grow to $630 billion by 2014. Forrester reports that less than 6 percent of American adults have ever used mobile payment. Americans seem stuck on paper money and credit or debit cards — behind both high-tech first world countries and the developing world in using phones as a wallet. Apple has told several UK mobile operators that NFC will not be part of the next iPhone, because Apple is concerned about the lack of an industry-wide standard. This is a great interview that I conducted with SAP's Dr. Ahmed El Adl last week. He discusses his new role at SAP working on enterprise mobility projects and strategy. Berg Insight estimates that the total value of the global mobile marketing and advertising market was € 1.72 billion in 2009. Growing at a compound annual growth rate of 41 percent, the mobile ad market is forecasted to be worth € 13.5 billion in 2015. While today mobile represents 15 percent of online advertising, by 2015 it will represent 64 percent of all digital ads. Recent reports show the total download app market for Android and iPhone will reach a whopping $15 billion by 2013. AOL is trying to transform itself from an Internet service provider to a media company, driven by advertising. And as attention shifts to the mobile Internet from the desktop, AOL realizes that it needs to kick start a mobile advertising business, too. The mobile marketing industry in Kenya is set to see significant growth with the launch of the East African chapter of the Mobile Marketing Association.